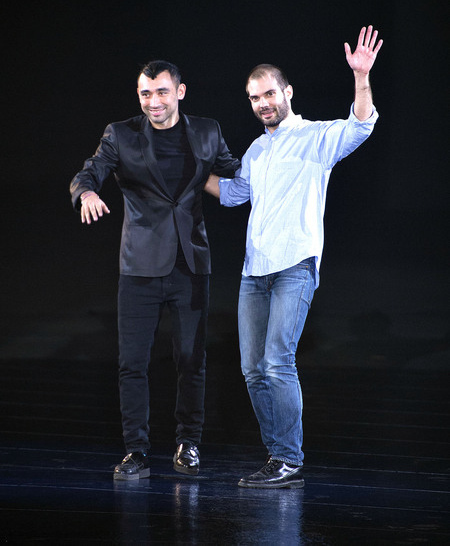 On Tuesday it was announced that Nicola Formichetti, who used to be the creative director of Mugler, was leaving the house after two years in realm. I don't know if this was a shock for many such as when the news broke out that Nicholas Ghesquiere was leaving Balenciaga *sad face* several months ago. I guess two years is not enough to gain an overly respect for someone in fashion. Thierry Mugler used to be one of the most popular french brands among many when its creator was under the brand. Who doesn't happen to have a vintage Mugler piece of history somewhere? Fast forward to the era in which Formichetti was beginning to take over the influence of the brand and Lady Gaga. This is what I was starting to love about Formichetti. He was turning these types of clothes into a very wearable, futuristic, and trending piece of garment for many young generations. You have to agree that we now live in an era where the young group of teenagers are our mass target to help grow a brand in the future. There was a magical touch that he gave to his collections that had a sort of avant garde look without looking dreadful. He somehow found ways to make sure a bizarre piece would be fashionably wearable and not fit for a museum. Celebrities became a huge fan of this brand, such as Kim Kardashian, who looked stunning in everything she wore; fashion-forward without appearing exaggerated. Well, the news had just been leaked out on Tuesday, and Thursday morning Diesel announced that their would be a new artistic director named to take charge all the creative aspects of its main line. Guess who it was? Yes, Nicola Formichetti was named new artistic director of Diesel. I can definitely see Nicola taking over the design perspectives of the Italian sportswear label. Diesel is all about risking it and being unique. And Nicola Formichetti seems to have all the qualities to fit for this new job. After all, I believe if Diesel doesn't have a wide young audience who is willing to spend several dollars on a pair of jeans or other clothes, maybe this may become the new talk of the young generations wearing their favorite brand. For now, my words are just simple opinions.